This sections starts auspiciously with Shri Ramakrishna Parmahansa’s experience and this is the narration on that, We seek your blessings guru-jee in all our efforts. Tadapi tava gunanamisa param na yati. "Oh Lord, if the blue mountian be the ink, the ocean the ink-pot, the biggest branch of the heavenly tree be the pen, the earth the writing leaf and taking these if Sarada, the goddess of learning, writes for eternity, even then the limit of Your virtues will not be reached." "O Great God, how can I express your great glory?" All came running towards that spot hearing the cries of Thakur. Mathur Babu was in the temple at that time. 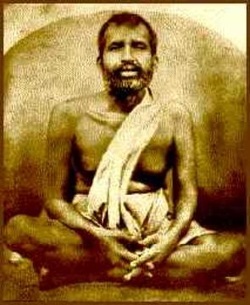 Hearing the uproar, he also came and prevented others from removing Sri Ramakrishna forcibly from the Siva temple. Mathur had already formed a high opinion about Sri Ramakrishna by that time. When Thakur came down to normal consciousness and saw the crowd, he asked Mathur whether he had done anything wrong. Mathur saluted him and said, "No, Ba Ba (father), you were reciting a hymn: I stood here lest some one should disturb you unthinkingly." Thus Mathur Babu protected and served Thakur in all possible ways for fourteen years like Nandi who eternally serves Lord Siva. Truly Mathur Babu and Hriday were to Sri Ramakrishna, what Nandi and Bhringi are to Siva. At another time, Mathur Babu actually saw Sri Ramakrishna as Siva and Kali alternately, as Thakur was pacing up and down. This experience happened in 1992. I had just then finished my graduation and searching for a job. It was about six months since I had listened to the Hymn to Dakshinamurti (Sri Dakshinamurti Stotra http://lavanya.aros.net/sanskrit/all_pdf/dakshina.pdf and also at http://www.hindunet.org/stotras/shiva/dakshiNaamurti_stotra.pdf) from my revered uncle, a rare householder Jnani. I kept contemplating on the meaning of the hymn almost always when the mind was not required to focus attention on a specific task. "To Him who, by means of the blessed symbol, manifests to the disciples the True Self that always shines within as 'I', constant in all the varying states of infancy, (manhood and old age), of jagrat (swapna and sushupti) and so on; to Him who is incarnate in the Teacher, to Him in the Effulgent Form Facing the South, to Him (siva) be this bow!" I kept telling myself that those relatives said that I had changed. But I see that this body has grown, no doubt, but I do not feel that I have changed. I am the same all along....and immediately after that reciting the above verse over and over waited for the traffic signal to cross the road. While crossing the road, there was alertness and no thoughts. After crossing I leaned against the piller of bus shelter and suddenly something happened. I could not see my body at all. I was light, consciousness, with blue hue, bright as sunlight but cool as moonlight on a full moon day. That was my Being. The pillar could be seen, so were the vehicles on the road. All the activities happening around derived the power from this light. There were no thoughts, no sense of belonging to anyone. I was Ananda, not rapturous ecstacy, but a steady stream of unconditioned bliss. All that was around was not different from the light. It was as if the light had its allotropic forms in the manifestation around. After a couple of minutes I could see the body but there was no feeling. I could see the footwear but not feel it. A bus going towards my place came and I boarded it. Paid the fare...all along no thoughts - (worldly activity can happen without mind) - alighted in the right place and walked back home. It took another hour after reaching home to get the body consciuosness and feeling back. Then onwards, there is no doubt that I am not this body though every happening about this body is similar to any other normal human body. The steady stream of Ananda - Sahaja Ananda continues on account of which I have not felt the difficulties and mental turbulence that came in way of my life ever since. Most of the time this Ananda makes me humming some song even during my office work. This, perhaps, was a foretaste of Awakening by sheer Grace of Sri Dakshinamurthi. This event may not be useful to anyone, but while reading "unchanging, birthless, deathless and Divine consciousness", I felt a strong urge to narrate this incident.